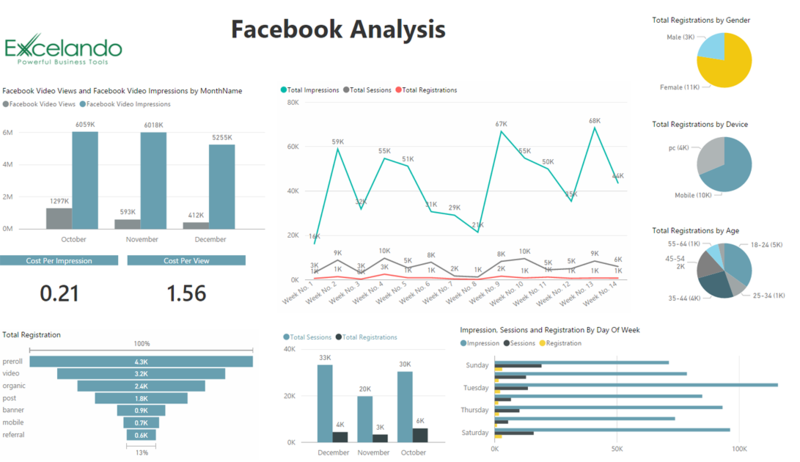 Digital Marketing demo using Power BI: Analyzes a digital marketing campaign from various media sources. The demo insights to campaign efficiency. This deeper understanding helps increase advertising revenue potential and optimizes marketing budgets. 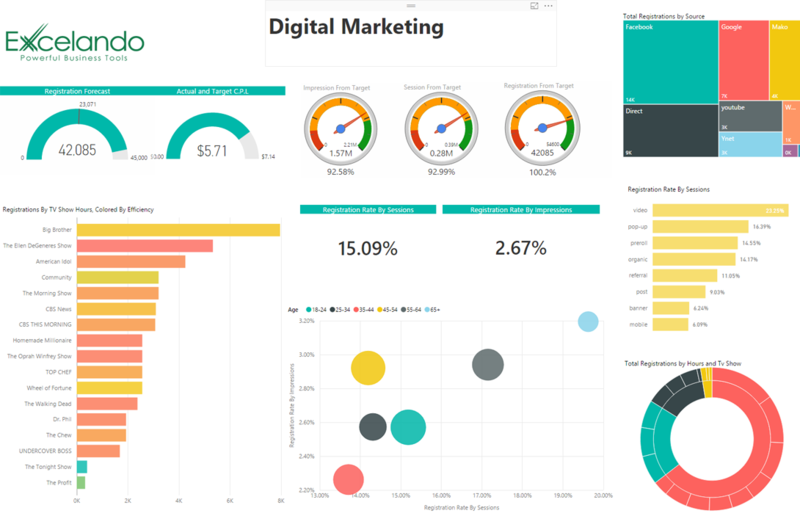 Digital Marketing demo using Power BI: Analyzes digital marketing campaigns from diverse media sources. 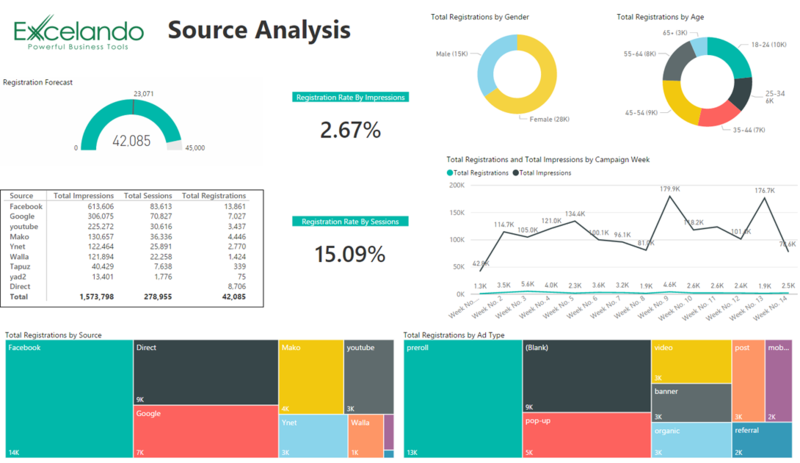 The demo provides insights into campaign efficiency, as well as a deeper understanding that helps increase advertising revenue potential and optimizes marketing budgets. Excelando Digital Marketing demo solution has the ability to analyze data from multiple media sources, covering program ratings, audience demographics, market details and more. Decision makers can view online which media source, ad-type, device, customer type or TV show provides the best results, best supervises the campaign, concentrates on sources with better ROI and fulfills the campaign's full potential. This understanding helps increase advertising revenue potential and optimizes channel marketing budgets. 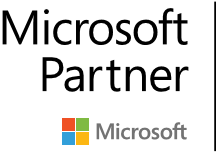 This natural and affordable environment is accessible from both office and mobile, and most importantly: all the information is in one place, clear and up to date, without the need for servers, software or experts.This Power BI demo solution can have a profound and positive impact on marketing. The solution is updated in real-time, eliminating the need to compile and reproduce reports. Executives use their mobile devices to quickly comment and share information with other employees or managers, resulting in heightened performance and a reduction in operational costs. Excelando provides insightful, real-world guidance that helps its clients elevate organizational performance. Excelando's team works closely with clients to deliver exceptional value and the best possible total cost of ownership solution.